World Recovered Paper Monitor - Fastmarkets RISI - Objective Insight. Better Decisions. 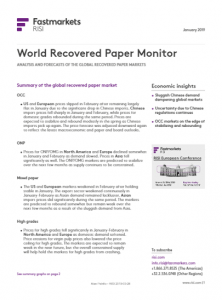 The World Recovered Paper Monitor provides a monthly analysis and two-year forecast of global recovered paper markets. 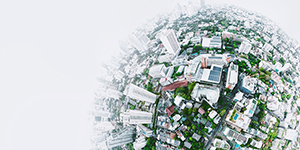 Each issue contains RISI’s proprietary monthly benchmark prices for the past year, as well as a quarterly one-year price forecast and annual second-year forecast for key export and import regions. Monthly trade for the past year is detailed globally by region. The U.S. prices cover eighteen different grades by region; Western European prices cover up to 8 grades for Germany, France, Italy and the UK, and Asian prices show those sourced from the U.S., Western Europe and Japan by grade. The Monitor also includes U.S. recovered paper consumption, inventory and exports. Additionally, RISI has acquired Bill Moore & Associates Fore$ight price forecasting services and incorporated the short-term service into the World Recovered Paper Monitor. Although Bill Moore remains an independent consultant, he contributes to the World Recovered Paper Monitor on a monthly basis. Annual trend data for up to the last twenty years covering regional pricing, demand, inventories, exports and imports is also included.